Vulcan never developed an underwater hammer of its own for offshore use. Although today use of these hammers for deep water projects is routine, the road to viable offshore hammers was a long one, even for companies better situated than Vulcan to get there. 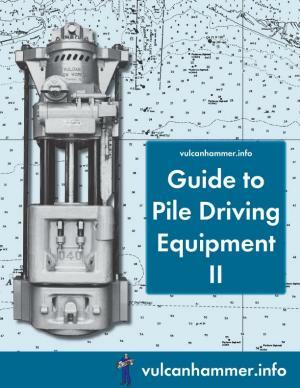 Vulcan’s first underwater hammer was the Mariner Pile Hammer, which was an adaptation and upgrade for its original closed differential-acting hammers. Vulcan made a few of these units, but the limitations of other aspects of underwater technology made onshore construction preferable “in the dry” for a long time. Piles had to have additional length to reach from the top of the jacket to the ocean floor, which both added to the pile weight and created a long transmission line for the stress wave, with the lossses to go with it. The “add-on” length was limited both by the working distance under the barge crane and the weight of the hammer assembly, which (on batter piles) creates a bending moment . As long as water depths and jacket heights were limited, these disadvantages were outweighed by the ease of construction that came from driving “from the top.” However, as the exploration for offshore oil progressed further from shore and projected water depths for platforms began to approach 300 metres, it became obvious that underwater driving–which would eliminate both of the problems described above–was the long-term solution. Vulcan’s eventual response was the “Ocean Pile Hammer,” which it presented to one contractor or another in a 20,000, 40,000, 60,000 or 80,000 lb. 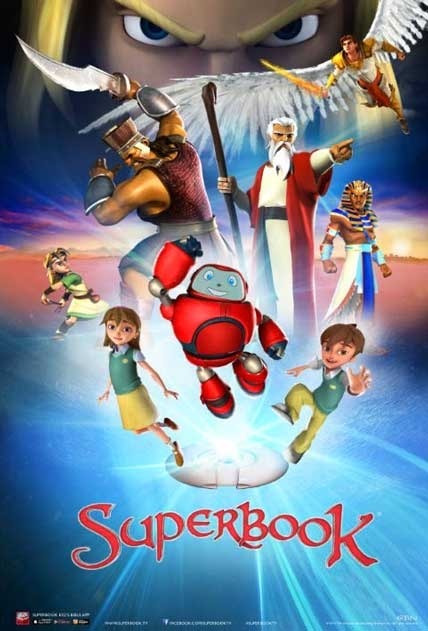 ram version. The hammer was basically a very large DGH-100 concept hammer, only with a single-acting mechanism. It envisioned the use of air or steam to power it, with additional air furnished to prevent the incursion of sea water. None of Vulcan’s customers took interest in the concept and so it languished. The “thin” concept of an underwater hammer, as embodied in a Raymond patent. The hammer 54 was threaded through the pile guides 38 to drive the pile 40. Vulcan wasn’t the only entity thinking about air/steam hammers underwater. Raymond, which had produced its own steam hammers for more than half a century, financed an interesting experiment in underwater hammers which didn’t work out as expected. Raymond recognised early on that one of the virtues of an underwater hammer would be that it would be thin, i.e., no larger than the diameter of the pile it was driving. This allowed the hammer to be threaded down through the pile guides on the sides of the platform. Also, by the early 1970’s Raymond had more experience than just about everyone else with hydraulic impact hammers with their 65CH and 80CH hammers. They understood that mobile hydraulics needed significant advances to be practical and reliable in an environment where both were crucial for economical platform installation. Raymond turned to Bolt Associates to develop an air hammer suitable for underwater use. The Bolt Associates hammer was the invention of Stephen Chelminski. This hammer attempted to replicate the basic construction and principle of tubular diesel hammers by placing an air gun at the base of the hammer. As the ram struck the anvil, the air gun would release highly compressed air between the two, giving the ram upward momentum. The air gun also cushioned the ram impact to some degree, which was more important for onshore application than offshore. Raymond took the concept and modified it for the “thin” style hammer it desired. Raymond was large enough of an organisation to finance extensive testing of the unit. Beginning in September 1974 they tested the RU-200 unit at Southwest Research Institute in San Antonio, TX. The 60,000 lb. ram hammer was placed in a 120′ deep cased hole which was filled with water. The hammer struck over 100,000 blows at refusal, performing well during the test. Pin piles, which were driven through the corner legs of the platform into the seafloor. Grouted to the platform after installation, these both provided geotechnical anchoring of the platform and structural reinforcement of the tower. They were to be driven from the surface, using a Vulcan 560. Skirt piles, driven around the pin piles (see diagram below.) Since they did not extend to the surface after installation, using an underwater hammer to drive them was advantageous as it eliminated long followers which dissipated driving energy. Anyone who is involved in pile driving equipment development feels that new concepts and equipment always seem to get their first try on the most difficult jobs, and that was certainly the case with the Maui field. To begin with, the sea and weather environment was poor, rivalling the North Sea. Throughout the first half of 1976, there were what seemed to be interminable delays due to weather, and the job was finally stopped in June. The hammer performed reasonably well when it had the occasion to operate. At the end of the year Brown and Root’s Atlas barge was replaced by Netherlands Offshore’s (NOC, the same company which bankrolled the HBM Hydroblok, shown below) Blue Whale. The Raymond hammer worked its way through the first part of 1977 with several breakdowns due to dirt getting into the system (lack of sensitivity to this kind of thing was a strong point with Vulcan steam hammers, and Raymond ones for that matter.) The oil company consortium (made up of BP, Shell and Todd) felt that the Raymond wasn’t getting the energy to the pile, so they turned the job over to NOC’s Menck steam hammers. 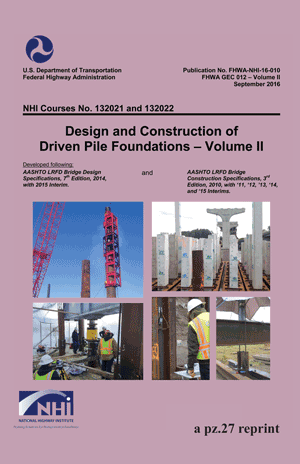 They didn’t do much better; what was happening is that the piles were experiencing severe plugging at the pile toe, a phenomenon poorly understood then. They resorted to jetting the plug with pressurised water (an unusual procedure offshore,) which helped some but not enough. NOC’s Blue Whale then was damaged during a severe storm in May 1977. The Raymond hammers, working off of a temporary work deck on the jacket, continued to perform, but in the meanwhile additional boiler capacity was installed on the Blue Whale during its repairs. The pile installation was completed in the last half of 1977 using the Menck steam hammers. Raymond did not use the Bolt hammer again. Raymond was active in the offshore market for the remainder of the decade and into the early 1980’s, purchasing a number of Vulcan hammers for its offshore operation. Oil companies, sensibly, would develop their shallower water fields first. Steam hammers were by far the more economical way of installing piling for these platforms. Although elevated oil prices do encourage development of marginal and otherwise expensive to develop fields (and that includes deep water,) during the 1970’s and early 1980’s the imperative to bring oil onstream quickly discouraged the experimentation necessary to perfect new underwater technologies. The market for these hammers was a classic monopsony, with literally a handful of buyers to sell to. Changes in the status of these buyers could make or break an expensive development programme. Combining the last two meant basically that, in order for a hammer manufacturer to put these hammers into the marketplace, it was necessary to find a “patron” who would finance the development of the equipment. An example of this on a much smaller scale was Vulcan’s IPH-16 with McDermott. With Raymond’s problems with its air hammer, it was also evident that hydraulic impact hammers were the best way to achieve an underwater hammer. The fact that American hydraulic component manufacturers during this era had allowed their technological edge to be seriously dulled in the field of high pressure mobile hydraulics favoured development in Europe. Beyond that, the North Sea, with its limited construction season, encouraged development of more technologically sophisticated solutions for platform construction. 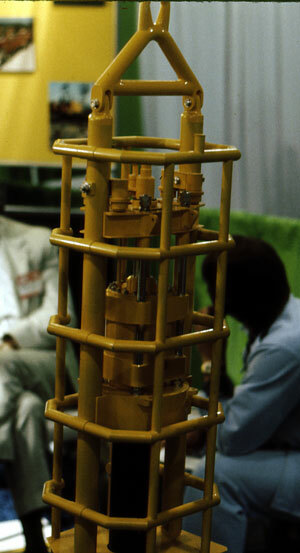 A model of the MRBS steam hammer in its guide cage, at the 1975 Offshore Technology Conference. 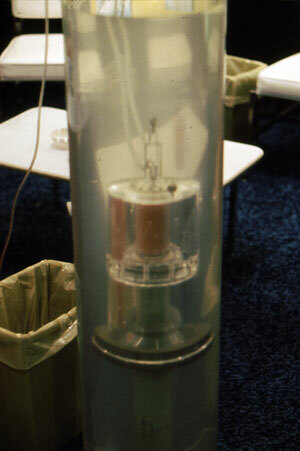 A Menck underwater hammer model displayed in an aqueous tank, at the 1975 Offshore Technology Conference. Menck’s underwater hammer programme had its moments. The first underwater hammer Menck produced for Heerema was the “thick” MRBU 6000. By Heerema’s own admission the hammer was “maltreated offshore after having driven only a single pile.” The “thin” MHU 1700 saw its first job as a prototype on the Fulmar field in the North Sea in 1980, and a year later on the Magnus field. These confirmed the basic viability of the hammer, and Heerema used the hammer on 3-4 jobs per year during the early and mid-1980’s. As is the case with most underwater hammers, it is necessary to feed compressed air to the unit to prevent the incursion of water, making the hammer a type of diving bell. As the MHU 1700 went deeper, the increased pressure and air density resulted in a signficant increase in the drag on the downwardly travelling ram. This occasioned the re-design of the interior of the hammer. On the Eider field, the hammer’s driving was so hard that the seals gave way and allowed ingress of water into the hammer itself. Nevertheless, through all of the changes in the marketplace and in Menck itself, the company continues to produce working hydraulic impact hammers capable of underwater construction. A successful underwater hammer which suffered an entirely different fate was the HBM (Hollandsche Beton Maatschappij) Hydroblok hammer. 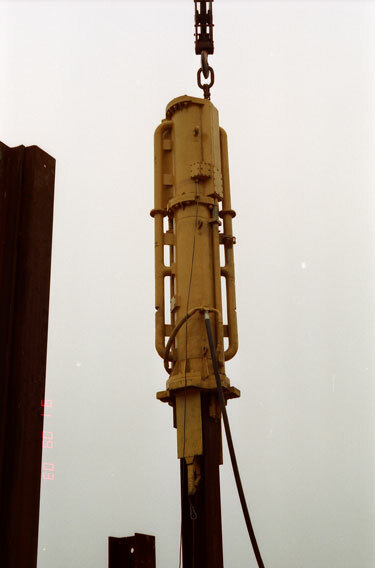 This hammer was developed by HBM for concrete piles onshore, and featured a gas cushion mounted into the ram. Adjustable, it lowered the peak force and extended the impact time of the hammer, which was a very favourable feature for concrete piles. The operation cycle of the Hydroblok hammer. The “Hollandse Beton Maatschappij” is the biggest Construction Company in the Netherlands. Since 1966 this company is trying to build an hydraulic hammer. The a.m. (aforementioned) patent (U.S. Patent 3,417,828) is the theoretical background for their invention. They built one prototype, a double acting hammer of 6000 Kg (+ 13.228 lbs) total weight, 100 blows per minute and with a rated striking energy of 5000 kgm (+ 36.150 ft.lbs) per blow. This hammer drives a pile four times faster than a Delmag D 22 hammer. They have now a bigger hammer in construction based on the same principles with 14.000 kgm (+ 101.220 ft.lbs) energy per blow, 100 blows per minute and a total weight of 15.000 Kg (+ 33.070 lbs). Mr. JANSZ of H.B.M. told me that they have the possibility to make a double acting hammer of 30.000 Kg (+ 66.138 lbs) total weight with a striking energy of 25.000 kgm (+ 180.750 ft.lbs). I suppose that the H.B.M. wants to sell this patent only to an American firm, building pile driving hammers, to build the hammer for the American market. It is not clear whether there was any follow up by either Vulcan or HBM to this contact. HBM’s main patron for offshore development was the Netherlands Offshore Company (NOC,) which financed the development of the larger hammers. These extended upward into such hammers as the HBM 3000, with an energy output of 1,580 kJ. Extensive information on these hammers is found here, along with details of the February 1979 test of the HBM 4000 and the “puppet weight” system to facilitate handling the hammer underwater. An HBM 1500 on a test pile in Amsterdam. HBM’s access to onshore test sites for large hammers was a major advantage for HBM (and later IHC,) a fact which Vulcan found out the hard way when it attempted without success to have the 6300 tested in like fashion. That underscored the disadvantage of Vulcan’s inland location. Although the centre of the hammer’s development was in the North Sea, a major incursion into “Vulcan territory” (the Gulf of Mexico) took place in 1977, when two HBM 3000’s was used on Shell’s Cognac platform. Performing at water depths of 300 metres, the hammers performed well, although, driving as they were into soft clay, the blow count generally did not exceed 20 blows/ft. Although the Hydroblok hammers were doing well, there were storm clouds on the horizon. Second, the principal designer for the hammers, Joost Werner Jansz, died suddenly 21 May 1979, just a few months after the successful test of the HBM 4000. Third, the gas cushion that was the hammer’s most interesting feature was well suited for concrete piles. 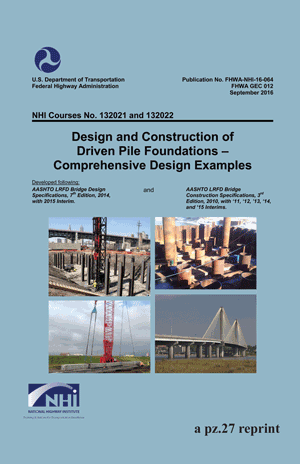 But for the high-impedance steel piles common offshore, a high peak impact force is the best. The Hydroblok hammers did well in easy to moderate driving, but against either steam or the Menck underwater hammers, in hard driving the Hydrobloks would reach refusal too soon. Fourth, all of the Hydroblok hammers produced were “thick” hammers. Platform designers were increasingly drawn to configurations that required “thin” hammers. HBM was working to address these problems, but time ran out rather suddenly when NOC was sold to McDermott. The latter decided that it had enough Hydroblok hammers for its requirements, and HBM’s entire underwater hammer programme collapsed. HBM’s parent sold the Hydroblok’s rights to Menck in 1981, and (except for some activity at BSP) the underwater hammer market seemed to be in the hands of one supplier. Another manufacturer to step into the offshore hydraulic hammer field was the UK’s BSP. One of their models was the “HA” type, which was basically a hydraulically actuated drop hammer; information on that can be found here. Another one was an open type hammer where the ram actually moved through the water (as opposed to the “diving bell” concept that HBM and Menck embodied in their hammers.) This was actually tested in Loch Linnhe, in Scotland, in 120 metres of water. This is the same concept that Vulcan developed in its Sea Water Hammer. Although BSP had some success in the offshore hydraulic hammer market, it never achieved success to the degree that its Continental competitors–Menck and IHC–did. Dik Arentsen, who had been head of Hydroblok’s R&D at the time of NOC’s sale, initiated the development of a new line of hydraulic impact hammers for offshore driving that addressed many of the weaknesses of the Hydroblok. It took some time finding a suitable corporate harbour to drop anchor in, but he and Ernst Mudde finally did so at IHC, where development of a new competitor to the Menck hammer took place. The S-400. Mercifully IHC lost the orange colour early in its corporate life. Vulcan first made contact with this group in 1982 and discussions went off and on throughout the 1980’s. The main stumbling block from Vulcan’s standpoint was that Vulcan was unwilling to invest in a large hammer (which were and are several times more expensive than their air/steam counterparts) give the market conditions it was facing. In the meanwhile IHC found a more receptive (and larger) customer in Heerema. Starting with an S-70, they proceeded to an S-400. Both of these hammers were successful, notably in the Gulf of Mexico, cutting into both Vulcan’s and McDermott’s territory. In 1988 Heerema ordered the S-2000. IHC was established and, with oil prices coming off of their mid-1980’s bottom, offshore came alive again with two major manufacturers of large underwater hammers. IHC’s line was not only set up for offshore but also for onshore application. L.B. Foster was IHC’s first distributor in the U.S., but some dialogue with Vulcan continued. After Vulcan’s merger in 1996, those discussions intensified, but to no conclusion. Finally in 2001, Vulcan’s parent sold the air/steam line to IHC, which formed Vulcan Foundation Equipment, and from 2001 to 2009 the two organisations were united until the Vulcan line was sold to Pile Hammer Equipment. 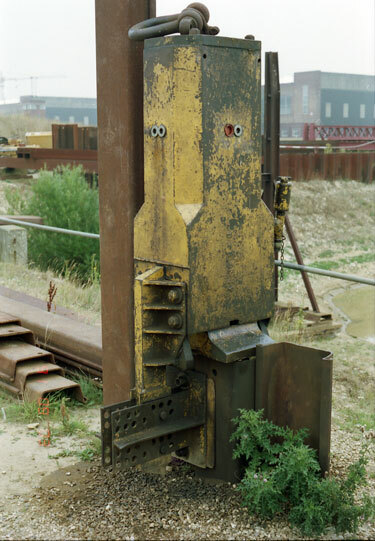 Although the IHC and Menck hammers were offshore underwater hammers subsequently adapted for land use, for most hydraulic hammers (such as the Hydroblok) the reverse is true. The first hydraulic impact hammers were developed for onshore use and those for offshore came afterward. In the early 1990’s, aware that hydraulic hammers were advancing in both markets, Vulcan investigated three types of hydraulic hammers. One was literally the first hydraulic impact hammer to be used in the U.S.: the Raymond. Vulcan acquired several of the 65CH and 80CH hammers, and eventually rebuilt an 80CH for yard testing. The initial tests showed promise but Vulcan’s difficulties in the mid-1990’s put an end to this effort. 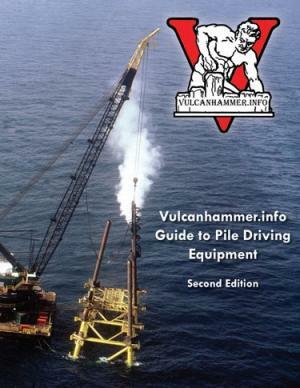 More information on the Raymond hydraulic hammers can be found in the Vulcanhammer.info Guide to Pile Driving Equipment. The Sermec Hammer. Note that there is only one hydraulic hose for the hammer. Both the supply and return oil came though one hose, which caused some hose whip. Also note the piping on the side of the hammer, which fed the oil to the impact area, which in turn cushioned the blow. Vulcan also took a serious look at marketing the Junttan hammers from Finland. Below is a video of this hammer being operated at Junttan’s facility in Kuopio, Finland, in January 1994. Vulcan investigated the possibility of a sea water hammer twice, first in the late 1970’s and second in the 1990’s, in partnership with its Russian associates. Details on that effort and its results are here. Vulcan also applied its vibratory line to offshore application, especially its largest model, the 4600. Vibratory hammers are fairly easy to adapt to underwater use, being generally hydraulic and with a closed case. “Raymond develops new underwater tool.” Offshore, 1974. Gendron, G.J., Nelson Holland, H.A. and Ranft, E.V. “Underwater Pile Driving at the ‘Maui’ Field.” OTC 3270. Offshore Technology Conference, 1978. Heerema, Edward. “Hydraulic v. steam pile hammers: contractor weighs the odds,” and “Which way for underwater use?” Offshore Engineer, February 1978, pp. 64-66. 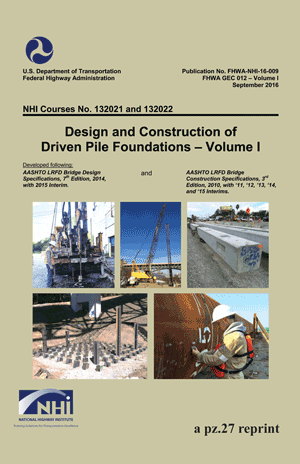 Jansz, Joost W., Voitus van Hamme, G.E.J.S.L., Gerritse, A. and Bomer, H. “Controlled Pile Driving Above and Under Water With A Hydraulic Hammer.” OTC 2477. Offshore Technology Conference, 1976. Jansz, Joost W. “North Sea Pile Driving Experience With a Hydraulic Hammer.” OTC 2840. Offshore Technology Conference, 1977. Jansz, Joost W. “Subsea piledriving: a breakthrough.” Petroleum Engineer International, June 1978. Jansz, Joost W., and Brockhoff, Henk S.T. “Unsupported underwater piledriving. Part 1: Theory and North Sea Experience.” Ocean Resources Engineering, December 1978, pp. 8-13. Jansz, Joost W., and Reinold de Sitter, W. “How to rate piledriving hammers.” Ocean Industry, June 1979, pp. 88-96. Heerema, Edward. “An evaluation of hydraulic versus steam pile driving hammers.” Offshore Engineer, June 1980, pp. 18-20. “HBM Designs Slimmer Hammers.” Offshore Engineer, October 1980, pp. 92-3. Knott, Terry. “Underwater hammers ready for a grander slam.” Offshore Engineer, August 1988, pp. 60-61.